Snook flies take on two variations in that they are either surface patterns or sub-surface patterns. In either case they are baitfish imitations in general and are often designed with a good deal of white in the color scheme. Large and predominant plastic eyes are also common to give the snook a target to aim for. 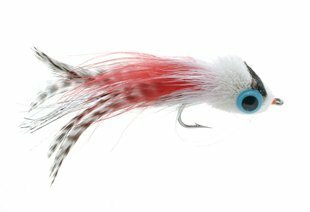 Pictured here is Snook-A-Roo, a pattern created by Jim Stewart that can be considered one of the prototype patterns for snook flies. Spun deer hair is common to the surface flies in this category of patterns with many of them taking on popper-like qualities. Sub-surface patterns contain a good deal of synthetic fish hair type materials and are normally designed to ride just under the surface rather than deep in the water column. They are also designed to push a good deal of water as Snook have an excellent lateral line for sensing vibrations.